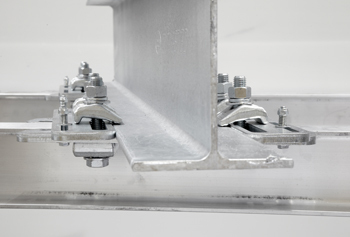 Fast Fit, a new product in the BeamClamp range, is an off the shelf engineered clamping solution to connect two steel sections together without the need for on-site drilling or welding. All you need to secure two sections together comes in one box. The system comprises a frame which wraps around the edges of the sections and slides into place to provide a position for the clamps to be secured. The Fast Fit system delivers a guaranteed connection every time without the need for on-site testing or relying on the skills of the installer. No removal of the protective coatings on the existing steel or holes is needed to make a connection. All that is required to complete a connection are simple hand tools and semi-skilled labour. Please click on the link to watch the Fast Fit installation video.